Become a part of an incredible group of volunteers who are dedicated to making a difference in your community. Members often say that they joined Assistance League for their programs and stayed for the friendships they formed. 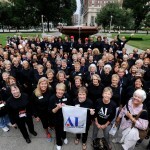 Assistance League offers unique volunteer opportunities that fit your interest and time. Read our Impact Stories to learn more about Assistance League chapters. Ask about our membership options. A national Member-At-Large category is available for former members who have moved to an area without a chapter nearby. Ask the National Director of Membership for more information.